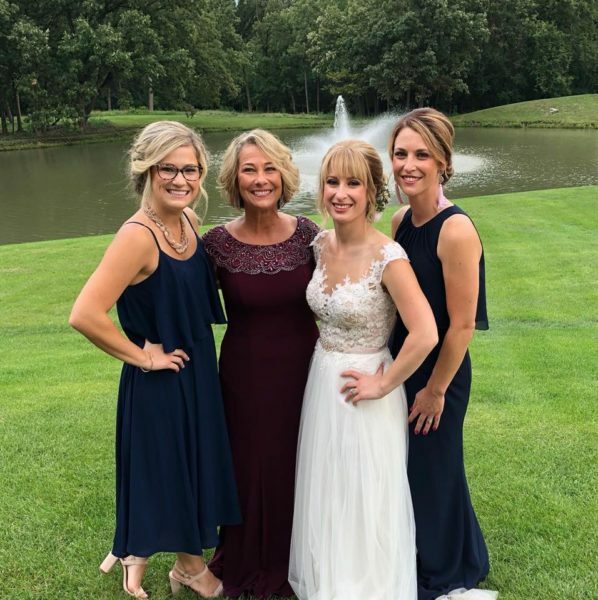 Another one of our own got married this past weekend! 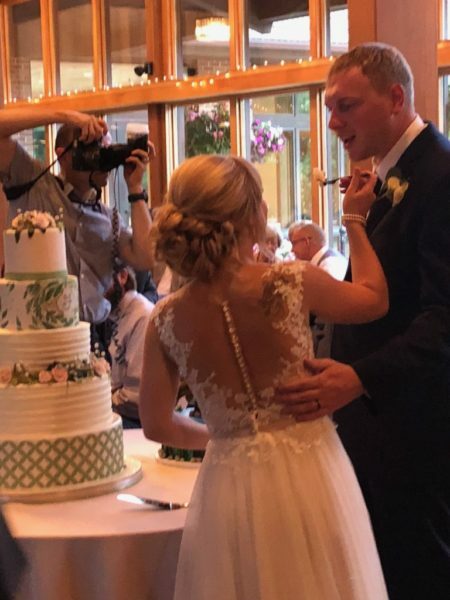 Ashley, our head cake decorator, and her fiancé Wyatt were married in an outdoor ceremony at Oak Brook Bath & Tennis Club over the Labor Day weekend. The theme of the reception was in keeping with the venue – simple, with beautiful natural accents throughout. During the ceremony, birds danced overhead and deer appeared at the edge of the forest. We were wondering when the Seven Dwarves were going to come out and start singing! Our Ashley looked beautiful in her wedding dress, which had a flowing skirt and a beaded lace bodice. Wyatt wore a simple navy suit and the groomsmen were dressed similarly in grey. The tables had navy linens and lanterns as centerpieces, which were surrounded by loose seeded eucalyptus. 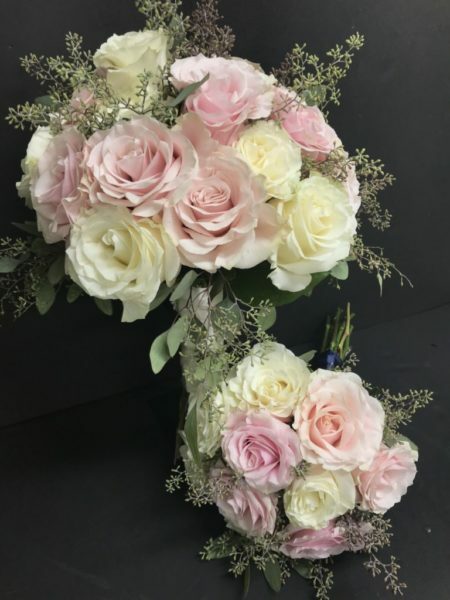 The flowers were gorgeous, provided by Mitchell’s Flowers in Orland Park. 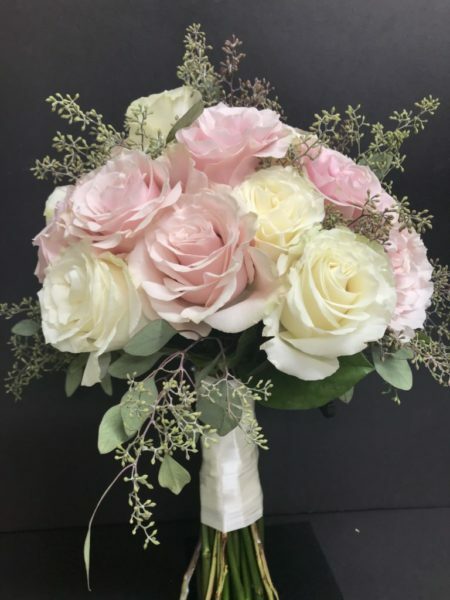 Ashley’s bouquet and floral pieces were white and pink Mondial roses, with seeded eucalyptus for greenery. The food was excellent! Tasty Catering did a wonderful job with the buffet. Many people at our table were talking about the Champagne Chicken and how moist and tender it was. Of course, the pièce de résistance was the wedding cake and groom’s cake. Ashley made the wedding cake; it was a reflection of herself, with different designs on all of the tiers. 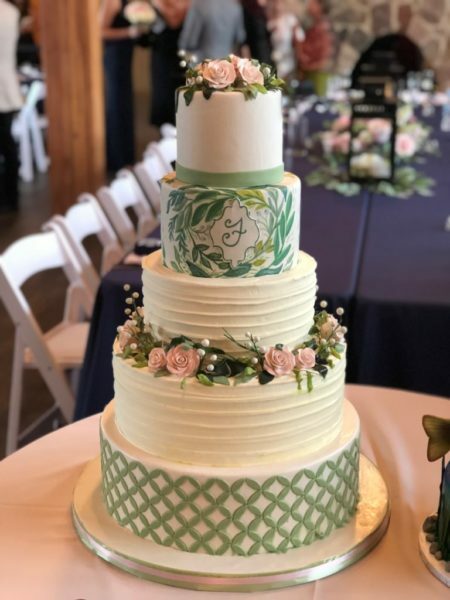 There were simple horizontal rustic iced tiers, a hand-painted eucalyptus tier with a monogram F and a modern-looking geometric leaf pattern, which anchored all of the design elements beautifully. 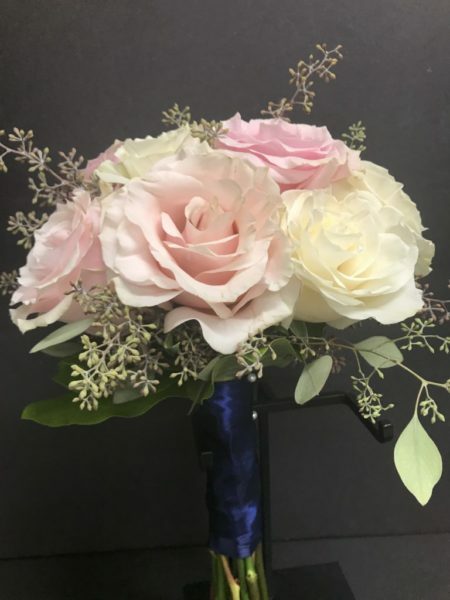 Pink sugar roses, eucalyptus, and white berries decorated the ledges and also acted as a cake topper. 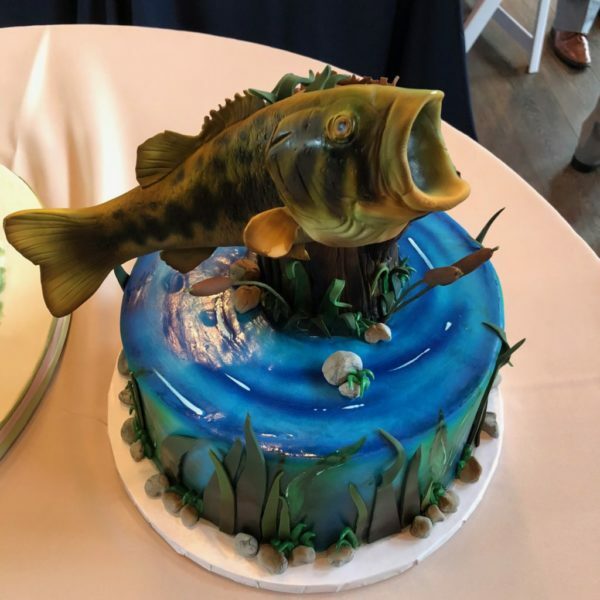 The groom’s cake featured an edible fondant bass and had a life-like lake scene – it was also made by Ashley. The flavors of the cakes were white/chocolate/white with white chocolate and chocolate mousse fillings. 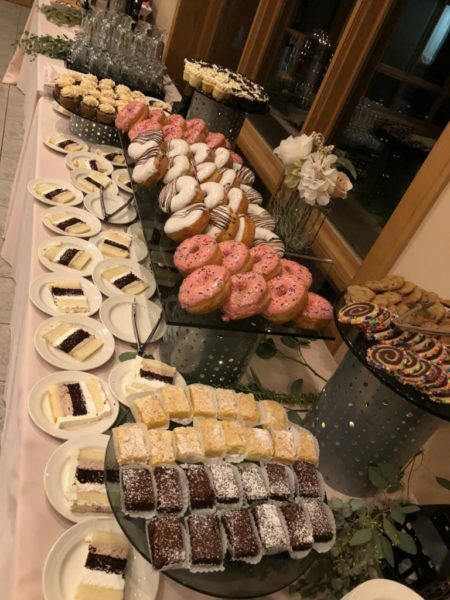 In addition to the cake, Ashley and Wyatt had a dessert bar with mini cupcakes, brownies, lemon squares, raspberry bars, cookies, and doughnuts. Something for everyone! It was a wonderful evening, filled with entertaining speeches, great music, tasty food – and most importantly – LOVE. Congratulations to the happy couple! 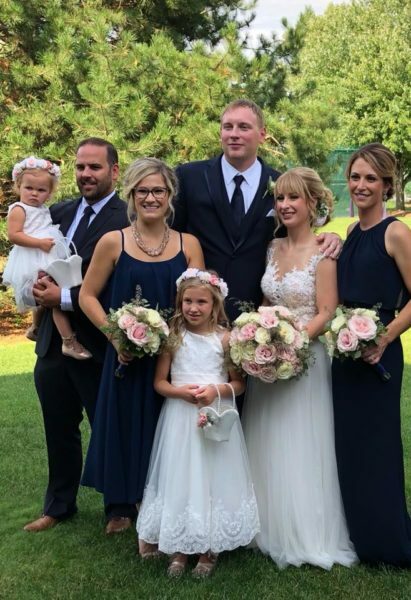 We’re so happy for you both!